Owners of the 4GB Xbox 360 Slim looking forward to some co-op multiplayer hotness in Halo: Reach are in for a nasty surprise: it doesn't work. I don't know what you had planned for this week but if you own a 360 Slim without a hard drive, one thing you won't be doing is hopping online with a few pals to join them in a desperate last stand against the Covenant. You see, while there's apparently no indication of this fact anywhere on the game box or in the manual, Halo: Reach co-op play requires a hard drive to work. Q: The error "One or more players do not have an Xbox 360 Hard Drive. An Xbox 360 Hard Drive is required to play co-op on Xbox LIVE or system link" occurs when I try to play. Why? A: One or more players do not have a certified Xbox 360 hard drive attached to their Xbox 360 console. 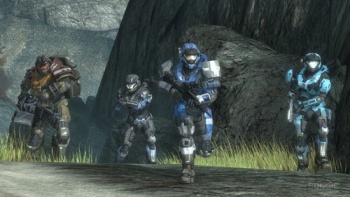 Some multiplayer aspects of Halo: Reach require an Xbox 360 certified hard drive. Microsoft told Eurogamer, "We are aware of the issue and are quickly working to resolve it," but this isn't exactly a new problem. Halo 3: ODST owners reported the same issue on the Bungie forums back in August. So either ODST didn't draw enough water to be worth the trouble to fix, or this problem is tougher to solve than Microsoft is letting on. Whatever the case, there's one surefire way around it for those who just can't wait: Shell out for an Xbox 360 hard drive. Hey, are you a fan or not?